Do you have jeans that you love, except when you bend over? 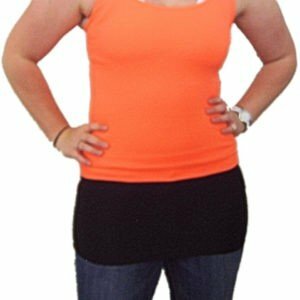 Do you have shirts that you love except they are a bit too short? Our shirt extenders are an ideal way to wear the things you love and stay covered. Stretch, reach, lean and bend – our shirt extenders will keep you covered in comfort while also helping to smooth the back, stomach and hips. You can wear them hidden or visible without bulk or getting too hot. Wear them inside your jeans if all you want is coverage. Wear them outside your jeans or legging for a fashionable, layered look. If you have surgical scars or a colostomy pouch, this is an attractive, comfortable way to keep them covered.